.. during the par-3 contest. Yea, he got a hole in one, started running around. Turned to fun backward and took a spill. Twisted his ankle. I can’t say I blame him, just unfortunate. But he did get a hole in one in a tournament Jack Nicklaus was playing in. "Yea, he got a hole in one, started running around. Turned to fun backward and took a spill. Twisted his ankle. I cant say I blame him, just unfortunate. But he did get a hole in one in a tournament Jack Nicklaus was playing in." Yep. It was crazy watching a guy pop his ankle back into place. If you read that entire article you'll see that this guy is one great athlete. They say he can dunk a basketball flatfooted. Yoi. Finau is two strokes behind the leader going into Fridays round. Vijay Singh at the age of 55 shot one under par for the day. Freddie Couples, 58 years old is at EVEN par, and Bernhard Langer , 60 years old is at plus 2. Spieth is a machine when he's on, McIlroy looks like a winner. Spieth tees off in a few minutes. Starting early today may help him ...... like he needs it. Thank .......... that was just a little gross. Back around 1968 I was playing racquetball and, anticipating my opponent's next "kill" shot, I headed from the back wall toward the front wall to get there in time to deal with it. As I moved forward the opponent slammed the ball and on his follow through hit me right at the corner of my right eye. He was an extremely strong player and a gash was made with the racquet and my eye popped out a little. I remember just moving it back in ...... then down the the University Hospital, a few stitches later and that was that. Pretty scary though. Yes, I saw that too. That was great. Jack Sr. actually said that hole in one by his grandson was right up there at the top of his Masters memories. 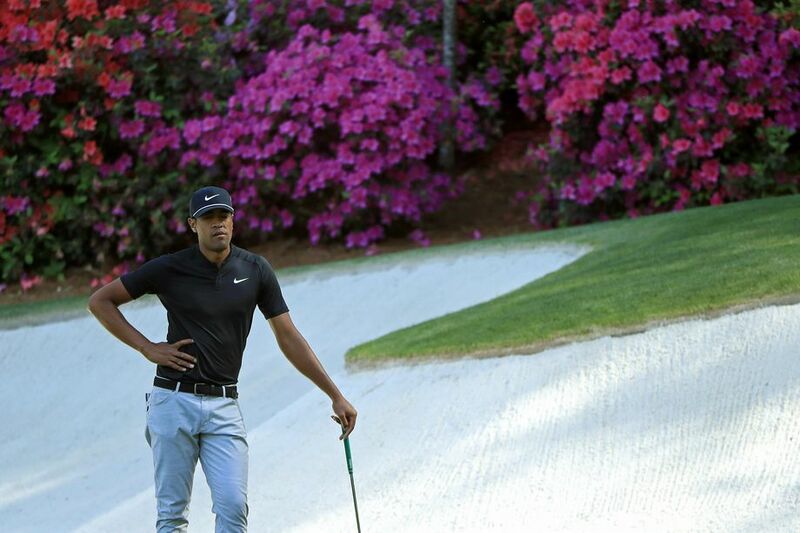 "If Augusta Nationals locker rooms were politically correct, they would have a cart for him to ride in for the rest of the Tournament..."
(so far) He's playing better than nearly everyone with that very sore ankle. He has taken some of the pressure off his front foot on his drives and it seems to be working (so far). There are only 34 Rules Of Golf. Visit PGA.com, an excellent site. But Jordan Speith yesterday.... five birdies in a row on the back nine, and then a all-world save for a bogey on 18 for a first round 66. He is the man to beat now. And Sergio.... five balls in the water. Five! He’s done and there will be no repeat champion this year. Finally, if Speith doesn’t win I hope Phil does. And if not Phil, then Rory. Looking forward to a great golf weekend. And Sergio.... five balls in the water. There's only two people who will ever be remembered at this tournament, the guy who wins it and Sergio for setting the record for the highest score on one hole..........LOL! Bad weather coming and the pressure cooker is heating up. "Tin Cup" Sergio without an anger fit - great play by the Amateurs, Sandy Lyle might play the week end --- THIS IS GOOD STUFF! I expect some good stuff to come from Kuchar and Hoffman. There’s only two people who will ever be remembered at this tournament, the guy who wins it and Sergio for setting the record for the highest score on one hole..........LOL! As far as I’m concerned Sergio did not win the Masters last year. His ball moved when he was moving pine straw and the penalty was not called. Rafa Cabrera Bello is tied for first presently and has played 10 holes today (Friday), yet both networks (ESPN and The Golf Channel) have chosen to show NONE of his shots. What a bunch of BS ----Tiger, Tiger, Tiger .....BARF!!!! "He is the man to beat now." not now ......(2:25 p.m.) Friday. Speith sits at 4-under, certainly within striking distance for the weekend. Heck, anyone within five strokes going in to Sunday has a chance. A car crashed into John Dalys bus. John Dalys bus was hit by a car while parked outside Hooters Friday near the site of the Masters. 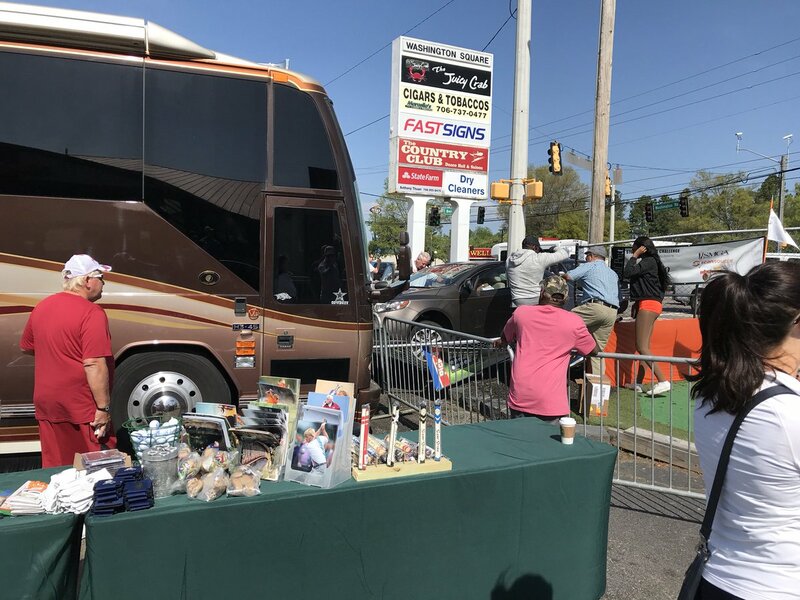 Daly parks a bus in the same spot on Washington Road in Augusta, Ga., every year during Masters week selling merchandise. Daly said a woman was attempting to make a U-turn on Washington Road when she apparently lost control, crashing into the parking lot area. Weather radars look to me like Augusta and the Masters will be able to get it done today. All that bull about a 90-100% chance of rain this afternoon looks like bull to me. Heh all you golf fans, get in the swing of it with Maureen O'Sullivan. Well, no big move by Speith today and Phil continued his self-destruction. Speith is too far out to close tomorrow. Rory McIlroy on the other hand... wow! And Reed, eagles on both 13 and 15. Should be a heckuva final round tomorrow.